When I watched the HBO series Band of Brothers, I was struck by how the soldiers, ill-supplied, freezing, and wearily dug into the snowy trenches of Bastogne, still made time to shave. The clean shaven face was and is military policy. 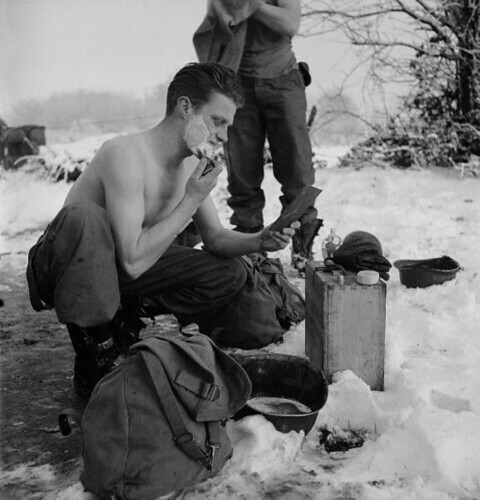 Even today, US soldiers, although they must do without hot water and baths for months at a time, still try to get in a daily shave. It might seem like a strange policy to civilians, but requiring the men to be well-groomed is believed to be important in preserving the men’s sense of discipline and the esprit de corps. Always shave with cold water. 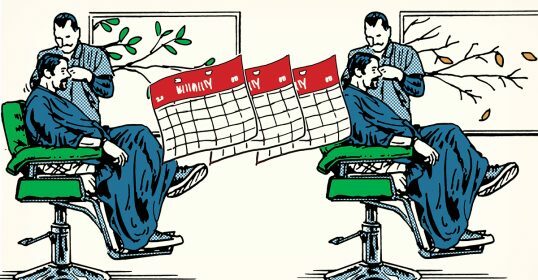 Barbers use warm, because they have to accommodate themselves to the habits of those whom they shave. The use of cold water saves much time and trouble— tends to preserve the smoothness and beauty of the skin; and when you have accustomed your face to it, you will shave as easily with cold water as with warm. Saves time. Granted, getting hot water in the 1800s was time consuming and labor intensive. You had to gather wood, start a fire, and wait for the water to boil. Fast-forward to today and all you have to do is turn on a faucet. But even then, it can take a bit of time for the water to warm up. So on those days when you’re running late and every second counts, using cold water can shave some time off your routine. Allows you to shave when hot water isn’t available. I think we’ve all had those moments when hot water just isn’t on tap: the heater breaks, your wife uses up all the hot water while showering, you’re fighting in the mountains of Afghanistan, or you’re traveling abroad and staying in a place without such luxuries. But when you have to be cleaned up and ready for work, inspections, or a date with an exotic local woman, you can’t skip out on shaving simply because you don’t have hot water. Cold water leaves the skin looking healthier. We’ve written about this in our post about the James Bond Shower. Hot water tends to dry out skin. If you want a nice looking mug, use cold water. I had to shave with cold water several times when I lived in Mexico. Sometimes I ran out of gas before the end of the month and was forced to bathe and shave with cold water (not fun in the winter time). That was over 5 years ago and ever since I got back to the States, I’ve been a strict hot water shaver. But after reading the old advice given above, I decided to experiment with a cold water shave. After getting over the shock of using ice cold lather as opposed to a nice, warm, soothing one, I have to say the cold water shave wasn’t that bad. The experience wasn’t too much different from hot water shaving and was more invigorating, waking me up. I did notice that my razor tugged on my whiskers a bit more than when I shave with hot water. But according to Shaving Made Easy that’s to be expected. Hot water softens whiskers, causing the blade to slip over them instead of cutting them. With cold water, my whiskers remained stiff, thus allowing the blade to cut every single one. It’s like the poor man’s Lectric Shave. Will I convert completely to cold water shaving? Maybe. Old habits die hard, but the benefits might entice me to cross over. At the least, I know it’s a viable option when hot water just isn’t available.